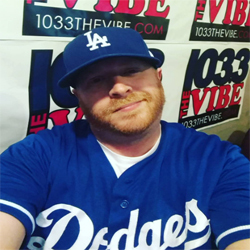 Spencer has been with 103.3 The Vibe since January 2010; however, he has been in the radio industry for the past 16 years. After taking an aptitude test when he was in 11th grade and seeing that 6 out of 7 job suggestions for him were radio or TV, Spencer knew radio was the best career choice for him. Spencer grew up in the 805 his whole life. He loved playing in bands and especially beat boxing, where he battled the likes of Matisyaho, and many other big names. Aside from his love for his career in radio, Spencer has a love for cars; he can often be found telling his own car how much he loves it and giving it pep talks! When Spencer isn’t in the studio working his magic on air, he enjoys motocross, snowboarding, skateboarding, surfing, and pretty much every other extreme sport. You may also find him at a local happy hour enjoying his favorite drink- Cadillac Margarita with no salt. A few hidden talents that Spencer often shares with the Vibe staff and listeners are: Flipping his eyelids inside out, he is great at impressions, he can gleek, blow bubbles off of his tongue, and crack his knuckles incredibly loud. His most amazing hidden talent that beats all those above is doing hair. Spencer grew up in a family of hairstylists, so he is a natural, and keeps the Vibe staff looking sharp at all times. Spencer appreciates all of his listeners and thanks everyone for tuning in. So keep on listening to 103.3 The Vibe!